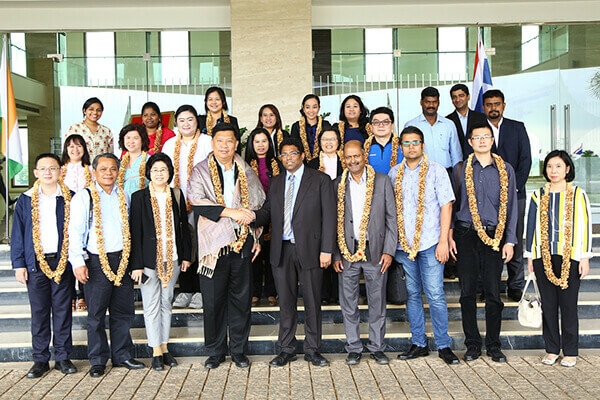 Sri City, September 15, 2016:- A 21 member delegation of senior officials of some of the public and private sector organisations, headed by Mr. Verapong Chaiperm, Governor, Industrial Estate Authority of Thailand visited Sri City on Thursday. Ms. Pornpimol Sugandhavanija, Deputy Consul General of Royal Thai Consulate General in Chennai accompanied the team. Impressed with the infrastructure and industry-friendly ambiance of Sri City, Mr. Verapong Chaiperm appreciated the initiatives taken by the Sri City management in developing such a large industrial park. He extended his heartfelt invitation to Sri City to be a part of the Industrial Development Corporation Network, to enhance the collaboration between Industrial Estate Authority of Thailand and Sri City. The delegation included senior executives from Thai government’s Industrial Estate Authority, Board of investment, and some of the leading industries. The purpose of their visit was to have a detailed study about the infrastructure, business ambiance and the policies available in Sri City. The delegates were given a detailed briefing on the world-class infrastructure and the brisk pace of development of Sri City. They all evinced keen interest and quizzed on different aspects of Sri City and SEZ policies and benefits. The team went round the campus and visited the production units of Isuzu Motor India and Rockworth, a Thai furniture company.